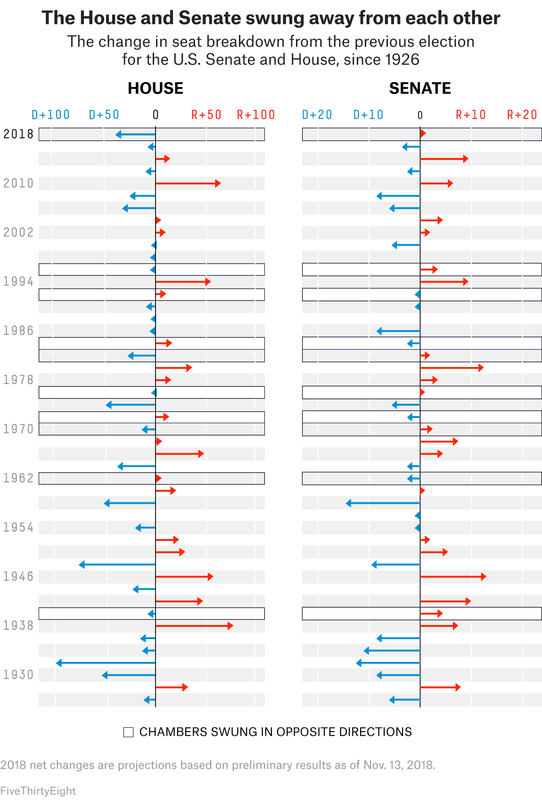 This midterm election saw an unusual trend, though it wasn’t unprecedented. The chambers “swung” in opposite directions, as Democrats gained seats in the House (they’re on track for a net gain of 38 by our estimates) and lost seats in the Senate (a net of one seat at the moment, but that number could change after the Florida race is decided and Mississippi holds its runoff). The chambers have moved in opposite directions 10 times since 1926, and what we’re seeing in 2018 is largely reflective of just how tough the Senate map was for Democrats. But if the Democratic pickup of 38 seats in the House holds true, that number will be even larger than in 2006 — the last time Democrats regained the House from Republicans, acquiring 32 seats. 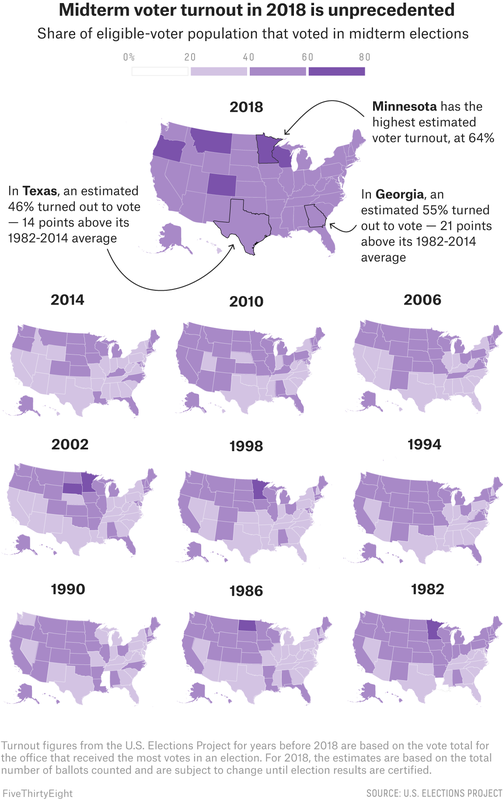 As you can see in the maps below, states generally experienced higher voter turnout this year, compared with previous years. This year, 23 states had double-digit percentage-point increases in voter turnout compared with their 1982-2014 midterm election average. In Georgia, where a competitive gubernatorial race took place between Democrat Stacey Abrams and Republican Brian Kemp, an estimated 55 percent of eligible voters exercised their right to vote, which is about 21 points higher than the state’s 1982-2014 average. That was the biggest change from the average of any state. The 116th Congress will have a large freshman class. 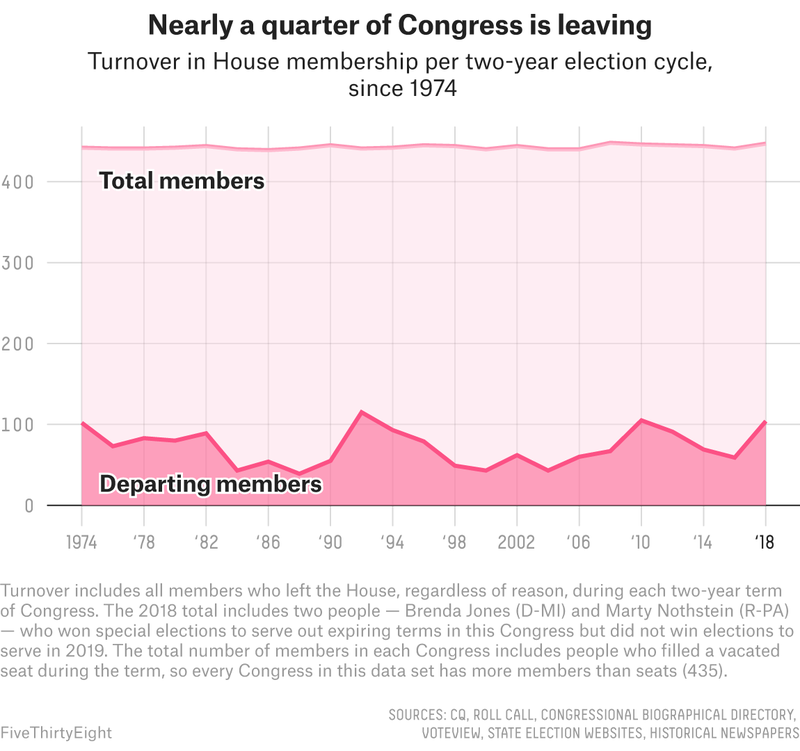 As Geoffrey Skelley wrote, the two-year congressional term ending in 2018 had the third-highest rate of turnover since 1974. In all, 104 members won’t return to the House in January, including members who lost re-election bids, but also people who left for any other reason, including retirement, resigning before their term was up and being appointed to another office; 1992 saw the most turnover, when 115 members left. The number of new faces expected in the next Congress is indicative of the change we can expect as we move toward a period of divided government. 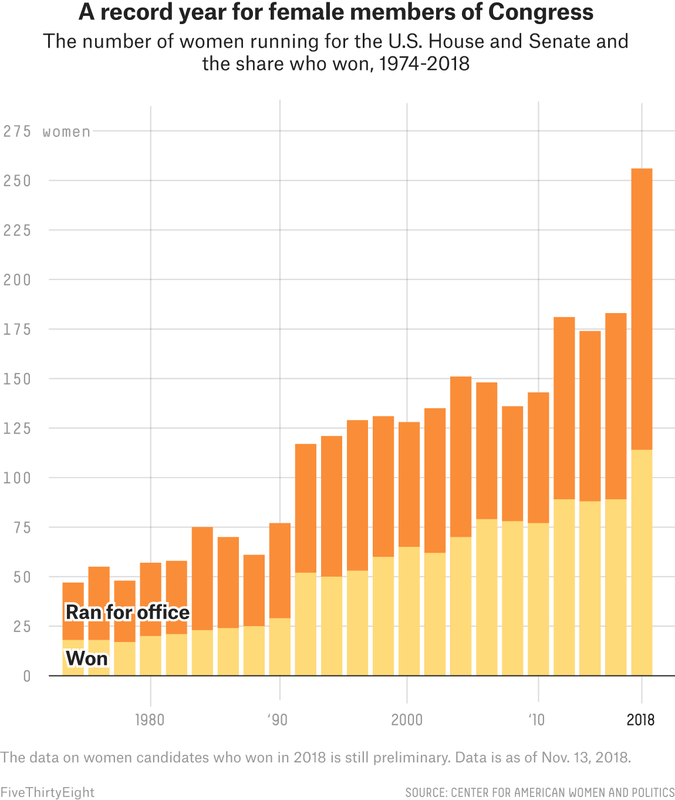 It was a historic year for female candidates — both for those who ran and those who won: 256 women were candidates for the U.S. House or the U.S. Senate in the general election, and as of Nov. 13, 114 have won, according to the Center for American Women and Politics at Rutgers University. That includes the Arizona Senate race, in which U.S. Rep. Kyrsten Sinema was declared the winner on Monday. The 116th Congress will see the largest class of female lawmakers ever. And expect that number to grow as several House races are still too close to call. Turnout figures from the U.S. Elections Project for years before 2018 are based on the vote total for the office that received the most votes in an election. For 2018, the estimates are based on the total number of ballots counted and are subject to change until election results are certified.